Love is in the air as the Stampin' Pretty Pals share the love with cards and projects for today's Pals Blog Hop! You've probably hopped over from Julie Trevett-Smith at The Stampin' Affair!, I'm stop number 27 on the Pals Hop and I'm glad you hopped in! I'll help you "hop along"" from blog to blog where you'll find great ideas for love themed paper projects from the Stampin' Pretty Pals! Should you hop off course, simply click on any of the links in the Pals Hop Line-up below and you'll be back on track. 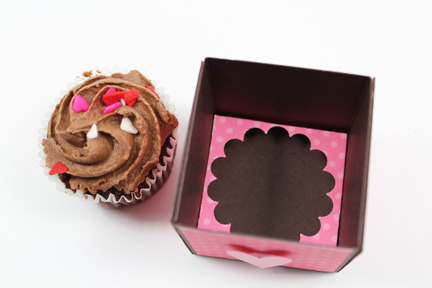 My project for today is a mini cupcake box. 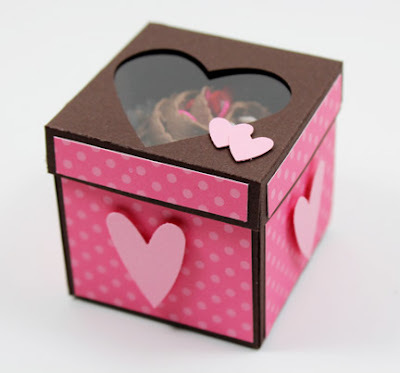 I've made cupcake boxes for regular size cupcakes and when I saw these Valentine Mini Cupcakes at the grocery store, I was inspired to make a sweet little box for them too. I think they would be cute to send to school for a Valentine's Day and since we can only send store bought treats, these would be perfect for the kiddos. UPDATE: If you would like to watch the video, please click here. Early Expresso, Pretty In Pink CS, Love Patterns DSP, acetate, Scallop Circle Punch, Full Heart Punch, Heart To Heart Punch, Mini Glue Dots, Sticky Strip, SNAIL & Stampin' Dimensionals. Base - 6" x 6" Early Expresso CS. Score at 2" & 4", rotate 90 degrees and score at 2" & 4". Cut on 2" & 4" score line to the first intersecting score line. Repeat on opposite side. Add sticky strip to the 4 outer tabs and assemble. Cut 4 - 1-7/8" x 1-7/8" of DSP and adhere to all 4 sides of base. Using Heart to Heart Punch, punch 4 hearts in Pretty In Pink CS and apply dimensional on back, adhere 1 in the center of all 4 sides of base. Insert - 2-7/16" x 2-7/16" DSP. Score 1/4" on all 4 sides. Punch Scallop Circle in center of insert. Cut on two of the score lines to intersecting score line and repeat on opposite side. Apply SNAIL to 4 outer tabs and assemble. Place inside base to hold mini cupcake. Lid - 3-1/8" x 3-1/8" Early Expresso CS. Score 3/4" on all 4 sides. Correction: lid is scored at 1/2" on all 4 sides. Center and punch Full Heart punch in the center of lid. Cut acetate 1-7/8" x 1-7/8" and apply mini glue dot in each corner. Adhere to inside of lid over heart. Cut on two of the score lines to intersecting score line and repeat on opposite side. Apply SNAIL to 4 outer tabs and assemble. Cut 4 - 1-7/8" x 1/2"3/8" strips of DSP and adhere to all 4 sides of lid. Punch 2 mini hearts with Heart to Heart punch in Pretty In Pink CS. Adhere to lid with mini glue dots. To print and/or save a PDF copy of these instructions, click on the PRINT button at the very bottom of this post. You'll also be able to edit and save only the portions of this post you want to save. Now hop along for more inspiring ideas from Jessica Ying at YoYoStamping Studio, stop number 28 on the Love Is In The Air Pals Blog Hop! Thanks for "hopping" by! ADORABLE!! It's on my list of 'to make'. Thank you very much for the directions! I love the Cupcake Box. Adorable! This is definitely a "one to try"! So cute! Thanks for sharing the instructions. Wonderful little box and so well executed. Great job. TFS! what an adorable box and THANK YOU so much for sharing all the dimensions. i'm going to try to put one of these together as a sample before my next club. Cute little treat box. Great cupcake. Now I'm hungry! Beth, this is such a cute adorable box and thank-you so much for sharing the dimensions. Looks so Yummy!! Beautiful pictures as well. That IS a sweet little box! Thanks for the dimensions! What a cute and fun little box, Beth! Love the heart window on top! Anyone would love to receive this on Valentine's Day! So cute, I will definitely be making some of these in my future! Thanks for sharing! Adorable!!!! Thank you for the participating in the blog hop. I am loving all of the projects. Hi Beth,just poppin in from the UK to check out all the lovely creations on this blog hop. I love your sweet little cup cake box and will be having a go myself.Now where can I find the cupcakes lol. Thanks for sharing. Very cute! I noticed you are from Shiloh, IL: I am from Troy, IL, but have lived in Belleville and Scott AFB. Did you get the cupcakes at Dierbergs? I miss that store: in Ft. Wayne, Indiana now. Many blessings to you! Yes, Dierbergs is the bomb....big, beautiful store and the employees are so friendly!